When you are looking for a set of wheels that offers fun and function, a motorcycle is a great choice for the adventurous at heart. A top choice in the industry for their commitment to excellence in every aspect, Kawasaki continues to dominate the market for a range of bike types. When looking to add this name to your collection, our Kawasaki motorcycle buying guide is here to help. The first thing to consider in our Kawasaki motorcycle buying guide is the matter of usage. A motorcycle isn’t designed to meet all your riding needs. For instance, there are big differences between a motorcycle meant for off roading and one meant for cruising down the highway. Before you consider the various models Kawasaki has to offer, you should consider the intended usage for your needs and lifestyle. Street. A street bike is meant for paved roads. These are highway bikes you can take on the road and use for either track racing, cruising, or just every day riding as your main mode of transportation. Dual Off-Road. A dual off-road bike is one designed for use on both paved surfaces such as the street and dirt trails alike. This is a versatile choice since you wouldn’t want to ride your street bike in the dirt or your strictly dirt bike on the highways. If you are looking for an option to do a little bit of both, this is the perfect fit for your needs. Motocross. When looking specifically for dirt bikes, and especially competitive riding, motocross bikes are the only option. These are bikes made for handling jumps and dirt without losing speed, traction, or maneuverability. Aside from the usage dictating the right bike, Kawasaki also offers several categories worth considering. These categories will help you decide which bike is right for your intended usage and preferences. Sport. The Kawasaki sport lineup features sleek street bikes made to offer power and pleasing visual aspects. These are meant for paved roads. The most popular Kawasaki sport model is the Ninja which is now offered in several editions and generations to meet a wide range of preferences. The Ninja offers agile handle, speed without a loss of stability, and an overall sleek design that makes it a top choice on todays market for a sport style motorcycle. Touring. A touring motorcycle is a classification of bikes meant for longer rides on paved roads. These offer bigger seats and more storage space making them ideal for long trips. A touring bike also tends to have a larger fuel tank and better wind blocking designs which also makes them a desirable choice if you intend to ride long distances on your bike. Kawasaki offers a SuperSport Touring lineup which offers all of the benefits of a touring bike coupled with a few of the sportier elements of their sport bikes. Cruiser. A cruiser is what many people think of when they picture a motorcycle. These are similar to the Harley Davidson models associated with “biker gang” culture. The body is made to offer a relaxed riding position, the engine is usually a powerful V-twin engine, and the overall aesthetic can be either retro and classic or a more modern take on the cruiser ideal. Cruisers are great for taller riders looking for more leg room so to speak as well as those looking for style coupled with performance. These can be used for every day riding needs or longer trips as needed. They are only for pavement riding. On/off Road (Dual). A dual bike offers the ability to ride on both paved roads and dirt trails but there are a few things to keep in mind. While you can ride this bike on the street, it doesn’t mean it’s well suited for longer rides on the same way a touring or cruiser bike would be. For starters, it has the more compact design of a dirt bike so there isn’t much in the way of leg stretch room, and while the suspension is good for handling off road conditions, the fuel economy isn’t meant for longer rides. These bikes are also harder for taller riders to find the right fit. Off Road. An off road bike is one meant only for dirt surfaces and not pavement. Off road bikes are made with certain elements as a focus of design. With the tougher terrain, the bike needs a powerful engine and transmission to work together with the tires to gain speed and maintain traction while also offering maneuverability over rocky terrain. The suspension on a dirt bike is also a major focus in a way not common to street related bikes. Since dirt bikes not only deal with rougher terrains but also jumps, tricks, and landing, the suspension on an off-road has to be top-notch. Once you figure out the right type of bike for your riding needs and intended usage, you can start honing in on a few important features. Here are the main things to consider when buying a Kawasaki motorcycle. Engine size. A smaller engine size, typically ranging from 250cc to 500cc, is ideal for those just starting out with motorcycles. It will help you familiarize yourself with riding without taking on more power than you can handle. Staying in this range ensures a lightweight and easy to maneuver bike. When you are already experienced at riding, you can take on a higher-powered engine size. The engine size will also be determined by the bike category. For example, a touring bike will have a bigger engine than a cruiser in most models. There are even models of Kawasaki that allow for the same bike to come with different sized engines, so you can get the right choice for your needs. New or used. The matter of whether you buy new or used will depend on your budget and what you are looking for in terms of the model. 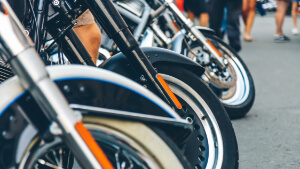 While the general consensus is that newer is better, there are plenty of used options on the market for those looking to add the fun and function of a motorcycle to their life without taking on the stress of a new auto loan. Seating position. The matter of how you sit on the bike is important in considering which one is right for you. A sport style typically requires you to crouch down and lean forward while riding. While some find this comfortable, others will think it’s a form of torture to ride in that position. Aside from where you position yourself directionally speaking, the matter of your legs should also be kept in mind. For example, a touring or cruiser bike will offer more leg room than a dual bike which keeps the legs bent at the knee while riding.